1980 - Corcoran School of Art, Washington D.C.
2016 - Published in "American Art Collector", Juried Competition, Alcove Press, Oakland, Ca. 2015 - Mackinac Memories Ltd. Publishes book on Maeve’s Art "The Essence of Nature - Maeve Croghan's Exploration in Paint of Mackinac Island, California & Beyond"
'Peaceful Mackinac'. 'Lilac Time' Painting wins major award. the Museum of Living Artist, San Diego, Ca. The Artist is invited to Japan has honored 'Artist' guest. "Mackinac - Mecca of the Mid West"
2005 - "Valley of the Moon" painting chosen for cover of "Vine Times"
Label Competition. North Tahoe Art Center, Tahoe City, CA. Label Competition, Sanchez Art Center, Pacific Grove, Ca. - Museum of the Living Artist, San Diego, Ca. 2011 - Ford House Museum, Mendocino, Ca. 2010 - Richard & Jane Manoogian Art Museum, Mackinac Island, Mi. 2004 - Coos Bay Art Museum, "Best of the West", Coos Bay, Or. 2017 - Stanford Inn by the Sea Gallery, Mendcoino, Ca. - Mendocino Inn & Spa Gallery, Little River, Ca. 2016 - Stanford Inn by the Sea Gallery, Mendcoino, Ca. - Visit Mendocino Gallery, Franklin Street, F. Bragg, Ca. 2015 - Castoro Cellars Gallery, Templeton, Ca. 2014 - Stanford Inn by the Sea Gallery, Mendcoino, Ca. - Stanford Inn Gallery, Mendocino, Ca. - Frank Allen, Mill Valley, Ca. - Boonville Hotel Gallery, Boonville, Ca. - G.F. Wilkinson Gallery, San Francisco, Ca. 2009 - Stanford Inn by the Sea Gallery, Mendocino, Ca. - Abrmason Gallery, Mendocino Art Center, Mendocino, Ca. 2006 - Auberge Mendocino Gallery, Little River, Ca. - Sausalito Consignment Gallery, Sausalito, Ca. - Sequoia Gallery, 1501 Post St., San Francisco, Ca. - Pedoncelli Vineyard Gallery, Geyserville, Ca. 1998 - Organic City Gallery, San Francisco, CA. 2016 - Gallery 1317, ‘RED’, 1317 Grant Street, San Francisco, Ca. - Stanford Inn Gallery, Mendocino Eco Artists, Mendocino, Ca. - Lymelight Foundation Invitational, ‘D’Art for ART’, Burlingame, Ca. - Visit Mendocino Gallery, Franklin Street, Fort Bragg, Ca. - Grand Hotel Tea Garden Exhibit, Mackinac Island, MI. - ‘Falkirk 6 Exhibit’, Falkirk Cultural Center, San Rafael, Ca. - "RED", Gallery 1317, San Francisco, Ca. - Castoro Beaverstock Artist Invitational Show, Paso Robles, Ca. - Mackinac Arts Council ‘Paint n Putt’ Invitational, Mackinac Island, Mi. Art Club", Pence Gallery, Davis, Ca. Land Trust, Glendeven Wine Barn Gallery, Little River, Ca. 2014 - Stanford Inn Gallery, Mendocino Eco Artists, Mendocino, Ca. - Mendocino Art Center Gallery - Instructors Exhibit, Mendocino, Ca. - Silicon Valley Art Fair, ShipYard Artists, Menlo Park, Ca. - "Tiny" Invitational Show, Studio Gallery, San Francisco, Ca. - "TINY", Invitational Show, Studio Gallery, San Francisco, Ca. - Glendeven Gallery, Mendocino Eco Artists, Little River, Ca. Library Gallery, Mackinac Island, Mi. - Silver Crow Gallery, "Gallery Artists", Marquette, Mich.
- Live Worms Gallery, San Francisco, Ca. - Arc Gallery, San Francisco, Ca. - Silver Crow Gallery, “Gallery Artists" , Marquette, Mich.
- Odd Fellows Gallery, "Miasa- Mendocino Artists', Mendocino, Ca. - Crooked Tree Art Center Gallery, "Gallery Artists", Petoskey, Mi. - Silver Crow Gallery, Gallery Artists" , Marquette, Mich.
- Ford House Museum, Mendocino Eco Artists, Mendocino, Ca. - "Delicious", Invitational Show, Studio Gallery, San Francisco, Ca. - River Gallery, Gallery Artists", Chelsea, Mich.
- SFMOMA Artist’s Gallery, San Francisco, Ca. - Rebecca V Gallery, Tacoma, Wa. 2007 - "Delicious", Invitational Show, Studio Gallery, San Francisco, Ca. - Mendocino Arts Council Whale Festival, Ft. Bragg,. Ca. - William Torphy Fine Art at Mad River Post , San Francisco, Ca. Competition, Culinary Institute of America, Yountville, Ca. Juror: Paul Brach, Nacogdoches, TX. Juried Competition, Juror: Dean Sobel, Fort Collins, Co.
Juror: Larry Rinder, Pacifica, Ca. - California Modern Gallery, Art Span Benefit Show, San Francisco, Ca. - Murray Hotel Gallery, "Mackinac 7 Spring Show", Mackinac Island, Mi. - Mackinac Island Library, "Mackinac 7 Summer Show", Mackinac Island, Mi. - 2006 - River Gallery, Gallery Artists", Chelsea, Mich.
- Whales on Parade, Ft. Bragg, Ca. - Mackinac Island Arts Council Annual Benefit Show, Mackinac Island, Mi. - Fetzer Vineyards, 'Mendocinio Wine Affair', Invitational, Hopland, Ca. - Silver Crow Gallery, Marquette, Mi. - Campbell Street Gallery, Grand Marais, Mi. - Market Street Gallery, Mes Art Invitational, San Francisco, Ca. - Murray Hotel Gallery, Mackinac Island, Mi. - Culinary Institute of America, Greystone, St. Helena, Ca. - Silver Crow Gallery, “Winter Gallery Artists Show", Marquette, Mi. - Three Pines Gallery, Cross Village, Mi. Juror: Sam Gilliam, artist, Galesburg, Il. - Three Pines Gallery, Juried Exhibition, Cross Village, Mi. - North Beach Gallery, Gallery Artists Exhibition, San Francisco, Ca. - View Points Gallery, Point Reyes Station, Ca. - Mackinac Island Library, Mackinac Island, Mi. - University of California San Francisco, San Francisco, Ca. - Castoro Cellars Vineyards, Templeton, Ca. - White Horse Vineyards, San Luis Obispo, Ca. - Mackinac Island Butterfly House, Mackinac Island, Mi. 1995 - Aptos Middle School, San Francisco Public Schools. - Hired as a special consultant to teach collaborative mural making. 1994 - Casa de las Madres, San Francisco. women's shelter & safe house. protective custody of the City of San Francisco. 2016 - Plein Air Painting, August 2017, Mackinac Arts Council , Mackinac Island, Mi. 2015 - ‘Plein Air Painting’, July 2016, Mackinac Arts Council , Mackinac Island, Mi. - ‘The Soulful Landscape’, Mendocino Art Center, Mendocino, Ca. 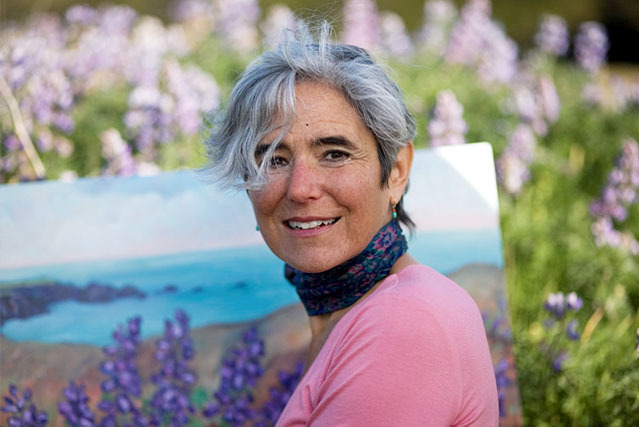 - ‘Expressive Plein Air Painting’, Mendocino Art Center, Mendocino, Ca.